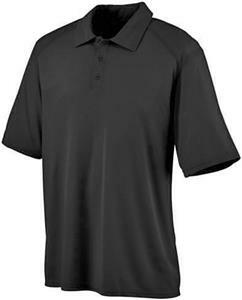 Augusta Sportswear Adult Vision Sport Shirt wicks away moisture from the body and has a heat sealed label along with a self fabric collar. It has topstitched armholes and forward shoulder seams. Set in sleeves and box stitched placket. Three matching buttons with cross stitching. Double needle hemmed sleeves and bottom. Top Selling Item. Chest Width (on half) 19 1/2" 21 1/2" 23 1/2" 25 1/2" 27 1/2" 29 1/2" 31 1/2"
Body Length * 28" 28 3/4" 29 1/2" 30 1/4" 31" 31 3/4" 32 1/2"
Love this polo! Awesome color pink, love the material, very comfortable, one of my favorites! Awesome shirt!!! Looks expensive and extremely comfortable in the Florida heat. Not only great for coaching, but great for business. I have order multiple shirts with my company name embroidered on them and they look perfect!